After packing your things and traveling across the world, you arrive in China. You step into the classroom where you will be teaching. Staring back at you are 20 pairs of young eyes. As you look around, you notice the windows at the side of the room and the courtyard outside where children play during the day. The walls are a light blue color and there are books and toys scattered at the back of the room. The noise of children talking has just died down and they’re waiting for you to say something. You’re ready to start your first lesson as an English teacher. Making the decision to teach English in China may seem daunting. If you happen to be a fresh grad, this may well be a job you never thought you’d consider. So I’m sure you have 100 questions – I know I did. What are the requirements for teaching English in China anyway? We’re glad you asked! 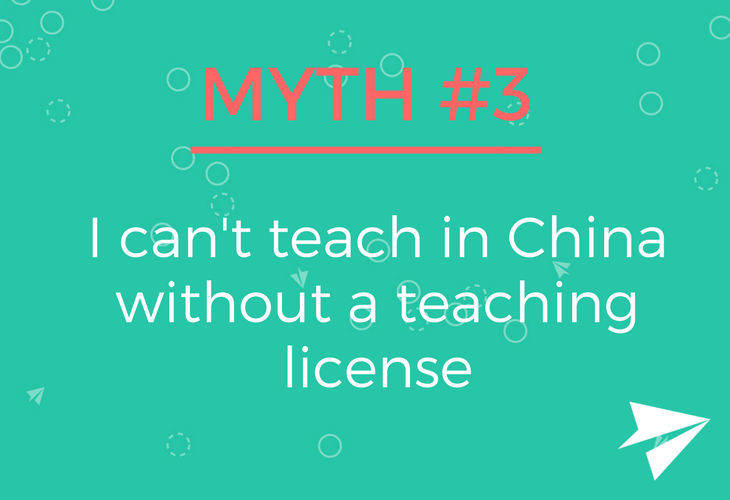 There are some common myths about teaching English in China that we’d like to clear up. Here are four important ones about what type of education and experience you need to get the job. Although you don’t need to have any teaching experience or a formal teaching credential, the Chinese government have been busy tightening things up on the Z visa front over the past few years. Nowadays, a reputable teaching job in China now requires successful candidates to hold a bachelor’s degree of some kind. Back up a minute, I hear you say. What’s a Z visa? Well, a Z visa just so happens to be the only visa that allows overseas teachers to legally work in China. Needless to say, it’s critical that you’re working in China under the proper legal status. This means you’ll need to abide by the Chinese government’s regulations – or they won’t grant you a visa in the first place. Pretty standard stuff. Takeaway: if a school or a recruiter claims that you don’t need a degree to land a teaching job in China, beware. While a few schools may still claim that you don’t need a degree to teach English at their schools, this is not a good thing. There are lots of scams out there, despite the Chinese government’s best efforts to crack down on these shenanigans, many of which target aspiring ESL teachers online. We don’t want you to get caught up in one. A huge red flag is any school or recruiter asking for a deposit of any kind up front – those supposed dream teaching jobs in China likely don’t even exist. If you do fall victim to an ESL teaching job scam in China, then best case scenario, you probably won’t get the same salary and benefits as your colleagues with degrees. Worst case scenario, you’ll be running afoul of China’s working visa laws. Oh! And don’t think that you can fake that all-important degree, either (although we know you wouldn’t dream of it 😉). The Chinese government now requires all qualifications to be apostilled. That’s an internationally recognized form of authenticating documents, in case you’re wondering. The good news about being a new grad is that there are many opportunities to teach English abroad, and China is no exception. Your major really doesn’t factor into the equation for hiring schools in China. The growth of people in the country who want to learn English means that demand is increasing faster than ever. And so the demand for teachers is increasing too. Native-English speakers with a variety of educational backgrounds are highly sought after for these teaching positions. So, with a Bachelor of Arts, Science, heck, even Engineering, Dance or Environmental Studies – can you teach English in China? Yes! There are options available for you. If this describes you, what you should keep in mind is that the best teaching positions (the ones that pay the highest salary and have the best benefits) are competitive. To be more competitive, consider supplementing your undergraduate degree with a TEFL certificate. Recommending reading: Why teaching English in China is a popular choice for new graduates. While being a licensed teacher will make you more competitive to teach in China, it is not required to secure a teaching job. Let’s say you have an undergraduate degree and a TEFL certification – you’d be a great candidate! If teaching is your passion, and you want this experience to kickstart your career, by all means, go back to school and secure a teaching license. This will certainly skyrocket you to the top of the recruitment list for hiring schools abroad. But with a desire and passion to go abroad, only having an undergraduate degree and TEFL will work totally fine. The top tier teaching jobs in China (full-time positions at private or international schools) do like candidates with two years of work experience, but this can be in any field – it doesn’t have to be in teaching. Many recent graduates go on to teach in China without any formal teaching experience. You do not need to have any prior teaching experience to get a teaching job in China, so long as you have a TEFL certificate. Many of the Chinese provinces require you to have 120 hour TEFL course, so going for the 120 hours is the best way to make you competitive for the highest number of positions. As always, having both teaching experience and TEFL is the dream team. 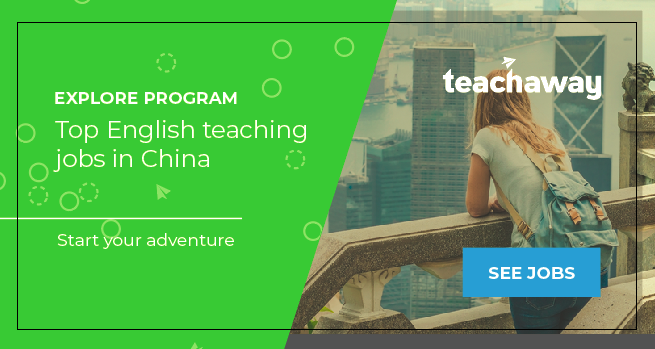 Now that we’ve debunked those four myths around requirements to teach English in China, you can continue your exploration English teaching job hunt with ease. There is, of course, a lot more to cover, like the visa process, what it’s like to live in China and average salaries. You can read about these on our handy teaching English in China info page. No matter what, be sure to do your research about the schools you are applying to. Not every place is going to be reputable – and you’d want to know before you get there. Teach Away’s Explore Program helps recent grads get teaching jobs with partner schools in China. We’ve done all the hard work up front, like vetting the schools and making sure they would be a great fit for recent grads. If that interests you, check it out. Now, what were you planning to teach for your first lesson? This post was originally published on TeachAway.com. Posted in Teaching Abroad, Travel. Bookmark the permalink.